Aerosol Science Laboratories, Inc. (“ASL”), Sinutopic, Inc. d/b/a Sinus Dynamics (“SD”) and Topical Apothecary Group, LLC (“TAG”) are compounding pharmacies under common ownership (collectively, the “Company”) that specialize in the formulation of compounded medications and proprietary delivery options for the treatment of sinus conditions including allergies, sinusitis and rhinitis. The Company’s pharmacists work closely with prescribers to provide effective Topical Sinus Therapy (“TST”) to more than 38,000 patients annually across the United States. The pharmacies are considered national leaders in the area of TST for their time-tested formulary and clinical pharmacist support for both physicians and patients. In May 2015, in response to tightening liquidity from declining revenue due to increased regulatory oversight of compounding pharmacies and pressure on insurance reimbursements in the industry, the Company consolidated its operations and retained SSG to evaluate strategic alternatives. SSG conducted a comprehensive marketing process to a wide universe of strategic and financial buyers to determine interest in the business as a going-concern. Several parties engaged in a thorough review of the business and submitted offers for all or part of the assets. 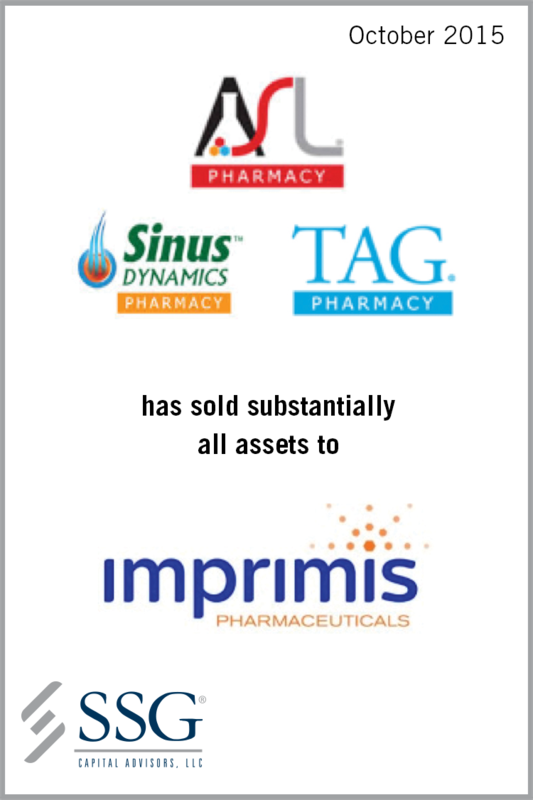 The offer from Imprimis Pharmaceuticals (NASDAQ: IMMY), a San Diego, CA based pharmaceutical company, was determined to be the highest and best offer.